Here is approximately how research works in a perfect world: data is collected from multiple sources, integrated, and analyzed, leading to some new results, new applications, and soon thereafter, world fame and maybe a Nobel. 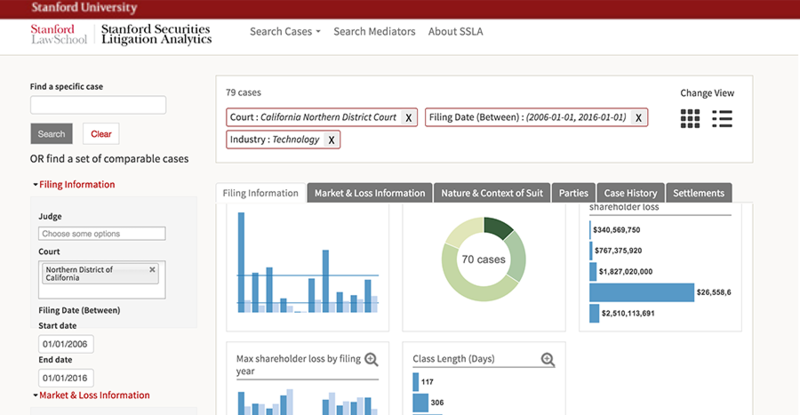 The Securities Litigation Database started as a simple faculty research project, examining a few variables in class action litigation. Since then, it has grown exponentially, with over two thousand data points collected per case. The subjects of the research included cases from different jurisdictions, with data on allegations, market data, parties, outcomes, and settlement payments. In short: there was a lot of stuff, with a lot of complex relationships between data points. The more the project grew, the unwieldier it became. Our goal was to give the researchers a tool to integrate all that data without losing the complexity or creating unnecessary duplicate work—again, enter Drupal. We were looking to build a research application—something site visitors could interact with and utilize—not just a collection of text and pictures. Drupal provided the bricks and mortar. Having started as a system to efficiently manage content, it proved a good framework for the research process. We were able to build a complex result reasonably quickly, capable not only of search but also of analysis and visualization. Drupal helped us build a tool that helped researchers. So if you think about it... that Nobel would be at least a little bit ours too. If not for Fibonnaci Web Group, the Stanford Securities Litigation Analytics project would not exist. After two failed attempts with custom SQL developers to overhaul the SSLA database, my colleague and I were ready to shut the whole project down. Fortunately for us, Fibonnaci came in to "right the ship." Within 6 months, and at a fraction of the time and cost of the prior efforts, Fibonnaci transitioned SSLA into its new research framework and helped us launch a public-facing website to explore the data. Most remarkable, Fibonnaci Web Group never felt like an outside consultant, but like a member of SSLA's internal team. The level of commitment to the success of the SSLA project and to the personal relationships developed along the way is unlike anything I've seen from other web development shops.